Here you'll find nutrition facts for different parts of a chicken, plus information on its health benefits and drawbacks so you can learn how to include healthy chicken recipes it in your diet. 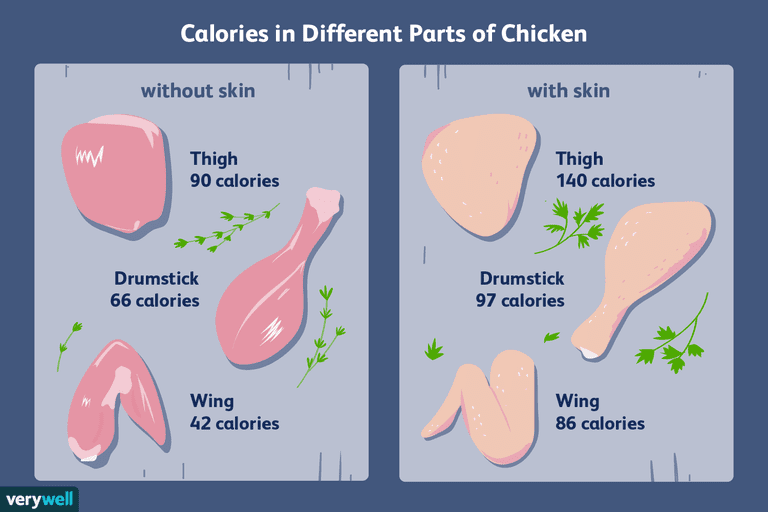 Chicken skin is another source of fat and calories. According to the USDA, a single ounce of roasted chicken skin (without the meat) provides 128 calories and 11 grams of fat. If you want to reduce the calories in rotisserie chicken, simply peel off the butter- and salt-flavored skin before eating. One medium, baked chicken drumstick with skin provides 97 calories, 12 grams of protein, 0 grams of carbohydrate, 5 grams of fat, 1 gram of saturated fat, 2 grams of monounsaturated fat, 1 gram of polyunsaturated fat, and 241 milligrams of sodium.